This instant storage shelter is the run in style. The shelter is 22 feet long by 20 wide by 10 feet high. It is designed to add convenience and safety to your farm. 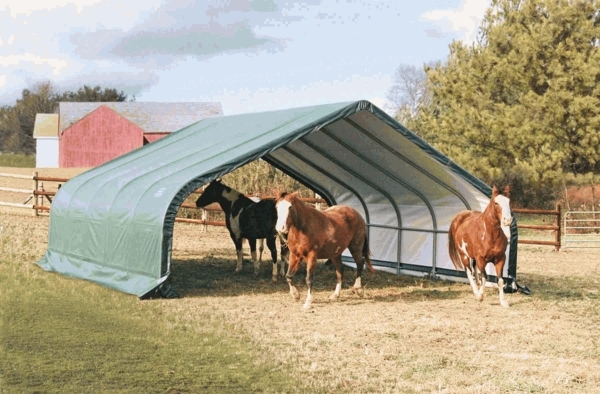 It gives instant shade to your farm animals and weather protection for your hay and feed. It features a sixteen gauge steel frame that can hold up under the hardest conditions. The powder coat finish eliminates corrostion, chipping and peeling. The shelter features a one year warranty. What is the height at the side walls? The side at the walls on the ShelterLogic 22 x 20 x 10 is 6'4".